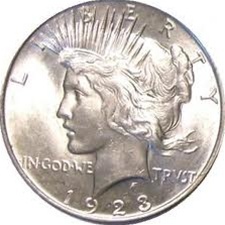 The 1923-P Peace Silver Dollar had a mintage of just 30,800,000. The composition of these coins is 90% silver and 10% copper. The diameter is of the Peace Silver Dollar is 38.1mm. There is a total of .077344 troy ounces of silver in each of these coins making them very popular with silver enthusiasts. The Denver and San Francisco mint mark is located above the tip of the eagles wings on the reverse. The Philadelphia mint coins did not have a mint mark.